LVIA has sponsored an annual Cherry Parade and Festival on the first Saturday of June for 40 years. This year it will be on Saturday, June 7 and the theme is Keep Calm and Cherry On. The Parade features lots of floats with local community queens, horses, and antique cars. Don&apos;t miss the deep fried cherry burritos! We also have a cherry pie eating contest and lots of craft vendors. Want to pick your own cherries from one of our 10 local cherry orchards? 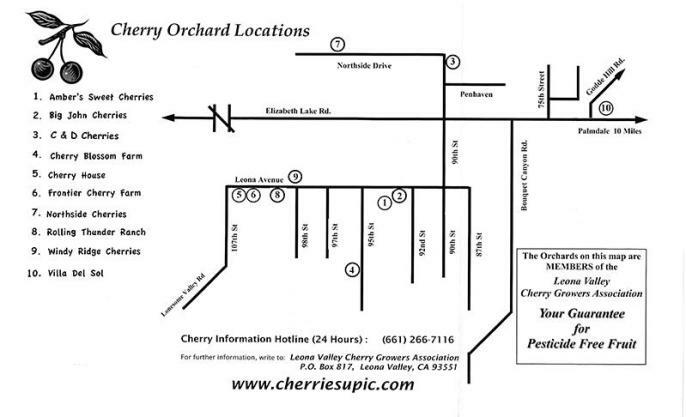 Get more information by calling the Cherry Information Hotline (24 hours) at 661-266-7116 or check out the Cherry Orchard Map below. Itis best to begin your search for an orchard at the center of Leona Valley. As you approach the center of Leona Valley, you will see signs directing you to the different orchards that are open or you can obtain orchard maps at the local businesses. From the (5) Golden State Fwy: Procedenorth through the San Fernando Valley. Take the (14) Antelope Valley Fwy north and exit at Palmdale Blvd. Turn left (west) on Palmdale Blvd. Travel west approximately 9 miles to the center of Leona Valley. Look for orchard signs or visit our local friendly businesses for a complimentary orchard map. From Santa Clarita Valley: TakeSan Franciscito Canyon through Green Valley to Elizabeth Lake Rd. Turnright on Elizabeth Lake Rd for approximately 7 miles to the center of Leona Valley and look for orchard signs or stop by one of our local friendly businesses for a complimentary orchard map. From Castaic: TakeLake Hughes Canyon (behind Castaic Lake) north until it ends at Elizabeth Lake Rd. Turn right on Elizabeth Lake Rd. and proceed 9 milesto the center of Leona Valley. Look for orchards signs or stop by one of our friendly local businesses for a complimentary orchard map. Remember: Itis best to begin your search for an orchard in the center of Leona Valley. As you approach the center of Leona Valley, you will see signs directing you to the different orchards that are open.